Hyaluronic acid: known for its moisturizing properties, it protects the skin from external aggressions and drying out. Rose Centifolia: its lightening and soothing properties make it a real active concentrate of radiance and light. Vitamin C: thanks to its antioxidant powers, it protects the skin from free radicals due to the sun, stress and pollution. Its light texture brings immediate comfort and envelops your skin with a delicate fragrance. Because of its softness, it is perfect for sensitive skin. 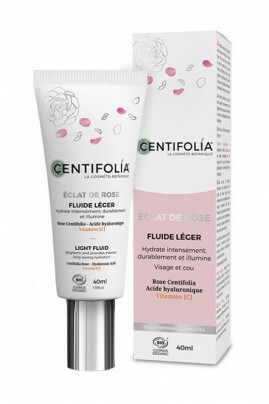 Centifolia Rose Shard Organic Light Fluid makes your skin smooth, fresh and radiant with beauty! A naturally hydrated and radiant face thanks to Organic Centifolia Light Fluid! In the morning and / or evening after cleansing your face, apply the radiance of pink on your skin with light massages. A natural composition with moisturizing ingredients!